Peppermint oil can increase a person’s immunity to various diseases and is commonly employed by those people with weak immune systems or who seem to frequently suffer from illness. 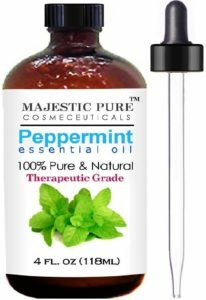 Peppermint oil is also known to have powerful antiviral, antibacterial, and anti-fungal effects, which is why it is used in so many alternative treatments. It is composed of camphor, menthol, and carvacrol, which are resistant to certain dangerous bacterial strains like E. coli, salmonella, and staph infections. I use only essential oil. Don’t just use the oil that smells like peppermint. This will not help. I put a few drops in my diffuser and turn it on before I go to bed. This is the brand I recommend.